Big-name Manchester United players have shown character and gone out of their comfort zone, says Louis Saha. Anthony Martial has a "great platform" to help Manchester United win trophies, says former striker Louis Saha. 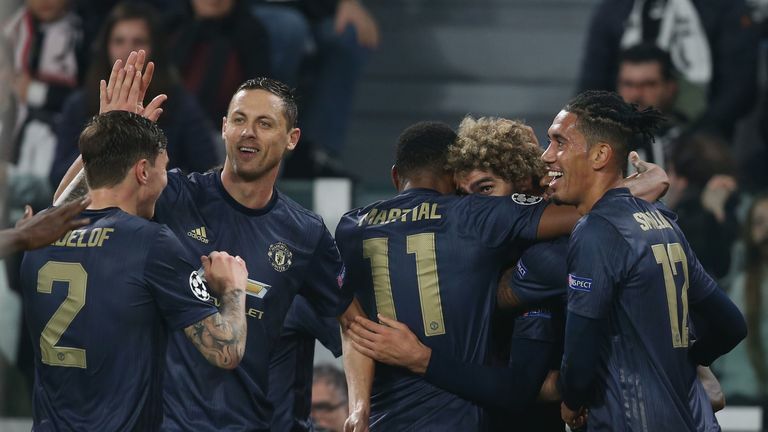 United, whose last title was the Europa League in May 2017, activated a year-long extension clause in the France international's current deal until 2020 but the forward has yet to come to an agreement over a new contract. Sky Sports News understands Juventus and Chelsea are keen on the player with the January transfer market approaching but Saha insists his countryman is at the right club. "He should stay because he has got a great platform," Saha, speaking at a Football for Peace event, said. "Of course he needs to understand the long-term plan is there for him because it is a personal career - it is not only about the club. "If you don't play well you have to remember a club will transfer you and fans will start to boo. But that is not the case of Anthony, he is a loved by the fans. He is loved by the manager I am sure. "It's an understanding, making a compromise in some ways, to make sure the player is happy and create a platform to win trophies again." Manchester United are still in transition and should remain patient with boss Jose Mourinho, claims Dutch legend Clarence Seedorf. Mourinho was said to be willing to sell Martial during the summer but the 22-year-old has scored six goals in his last five Premier League matches to become integral to United. "I think the situation was more about the actual understanding - sometimes you have a feeling something is missing; the players, the tactics," Saha said. "As a fan, as someone who has been there in the club and as a forward sometimes I was feeling the link between players was not there. Anthony Martial will join Ruud van Nistelrooy, Cristiano Ronaldo and Eric Cantona if he scores for a sixth league game in succession against Crystal Palace on Saturday. "He has been asked to take a lot of responsibility in the field because he is a tremendous player with a lot of quality. "You could see sometimes his body language was wrong. But the last few weeks he has just been an immense player. "Doing a lot of defensive work, celebrations that I have not seen before so he shows a lot of quality signs that you can be very happy about. If he can replicate that and impact other players around him it will be a massive change." Saha also believes several of the side's big players have gone out of their comfort zone to deliver important performances, with the club's derby defeat before the international break ending a four-match unbeaten league run. "The results have been better but I see some key players have shown a lot of character and qualities which were out of their box which is very encouraging. "I love the way communication wise they have done a lot of effort. Club wise, players, manager they had to show the message of unity and [being] United in some ways. "It is all about results in the sport so they have done pretty good… to come back in their ways."